I’m gonna start with letting you know, that I know, I probably should have let this go, but that’s just not who I am 🙂 Anyway, the other day, a friend of mine, Troy, who I used to work with sent me an email about a new site he just launched. He mentioned that he put a post up on Digg and if I was interested in Digging it, he’d appreciate it. I thought the site was cool, so I had no problem helping him out. Basically the site was created very similar to the famous Million Dollar Homepage, only Troy’s was focused on helping the environment. Visitors to the site can donate $2, one of which goes directly to the Arbor Foundation to plant a tree, the other goes to paying for a spot on the main page, which is designated by placing a virtual tree in the space payed for with a link back to the owners site. I figured that since it was for a good cause and website owners could get a link out of it, Sphinn (“Digg” for Internet marketers) users might also be interested, so I posted the site in the Link Building category. 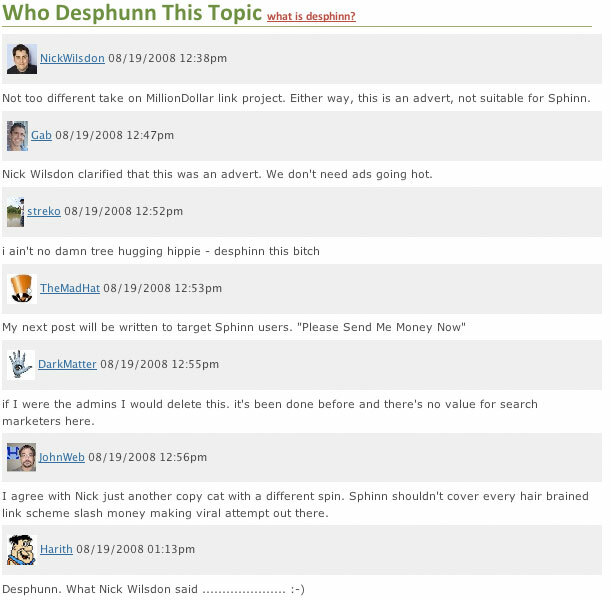 This may have been the worst idea I’ve had in my history of working in the SEO industry, because the Sphinn community went into assault mode on both Troy and I.
I’ve decided to speak out on a few of the comments and get my thoughts out. Since the Sphinn community didn’t want to listen to anything Troy or I had to say and had already basically labeled me a spammer, I decided to do it on my blog instead of in the comments section, so here we go. How is there no value here? You get a link back to your website. Hmmm, and Digg, I mean Reddit, I mean Sphinn is completely original, huh? What’s wrong with taking an idea and reworking it? So Nick Wilsdon knows all now? He clarified it, so it must be true. There were also some comments about Troy using the environment for his own greed, taking advantage of people who really want to help, etc. Well the fact is, he was trying to help. Even if he is making money off of it, any possible way to get people to help donate to the Arbor Foundation is helping. A few people even decided to protest my post on Sphinn and directly donate to various charities. Would they have done that otherwise. I’m betting no. Not to say that it was mine or Troy’s doing that got those people to donate, but people need inspiration to donate and that’s what Troy’s site is trying to do. He’s not forcing people to put money in his pocket either. If you want a link, donate $2 and plant a tree, and go to the Arbor Foundation and donate $10 more. It’s as easy as that. That’s pretty much the jist of it, but there were somewhere around 40 more comments. I wanted to pull out some more of them, but the post was removed from Sphinn, so I could only work off of a cached version on Yahoo. Anyway, everyone had a similar comment and just wouldn’t let me or Troy get a word in. Once it was “clarified” everyone jumped on the bandwagon. To the people who DID Sphinn my article, thank you. I think anyone who Sphunn it, knows who I am and understands that whatever the commenters of the post said wasn’t true. I have never been a spammer and don’t ever plan to be one, so that wasn’t my intention. I’ve told the entire truth in this article, and after everything is said and done, you can believe what you will. Basically, I was just trying to help a friend out. If there’s anything I’ve learned from this experience though, it’s that I’m no longer comfortable at Sphinn and I’ll just continue using it as a resource and not a social community. I’m guessing the users over there would prefer that anyway.